Animated STAR TREK - "The Magicks of Megas-tu"
While exploring near the center of the galaxy, the U.S.S. Enterprise stops at Megas-Tu, a planet where magic and witchcraft are the norm, and their guide is Lucien, who is Lucifer of Earth mythology. PSA epilogue for "The Magicks of Megas-tu"
This episode's author, Larry Brody, also wrote the story for the STAR TREK: Voyager episode "Tattoo", and Mr. Brody has his own web site. This show was controversial in that it dealt with witchcraft and Satan was portrayed as a benevolent character. In one scene, Sulu conjured up a beautiful woman and was about to embrace her when she turned into Lucifer! Calling all censors! In this episode, Lucien was a humanoid who took the form of a half-man half-goat. He was one of the Megans who traveled to Earth and he was the basis for the character of Lucifer in early Earth mythology. He was full of life and had a mischievous streak in him. This episode provided an explanation for part of Earth history. Apparently the persons considered to be witches and warlocks from 1260 -1690 A.D. were Megans who accessed power from their universe to perform acts which simple humans perceived as magic. Four years later, Gene Roddenberry would revisit this theme of the occult, witchcraft and demonology (and the character Asmodeus) in his 1977 Spectre made-for-television movie which served as a pilot for a potential series. 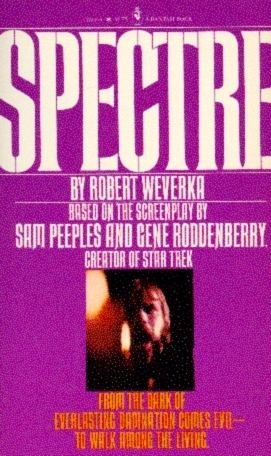 Spectre was co-written by Roddenberry and Samuel A. Peeples, and directed by Clive Donner. In the film, William Sebastian (played by Robert Culp) is a criminologist who studies the occult to explain the problem of human evil. He has been cursed on one of his adventures, leaving him in constant need of medical attention. Sebastian summons an old colleague, Dr. Hamilton (played by Gig Young) to his home to help him. The two are soon summoned to England to investigate strange happenings involving a mysterious Satanic cult and the demon Asmodeus. The series never sold, but the film was novelized and the cover is shown at right. In a scene that must have been a strange sight for children on Saturday morning, Kirk and Spock drink a toast of what must have been beer from large tankards provided by Lucien! Ed Bishop provided the voice for Asmodeus the Megan prosecutor in this episode. Ed Bishop (pictured at right) is best known for playing Commander Ed Straker on the British television science fiction series UFO (1970-71) created by Gerry Anderson & Sylvia Anderson. Bishop had also provided the voice of Captain Blue (pictured left) a senior staff officer and usual partner of Captain Scarlet on Gerry Anderson's supermarionation series Captain Scarlet and the Mysterons (1967-68). Filmation, the production company that created the animated STAR TREK series, had plenty to do at the same time that STAR TREK was being produced for airing on NBC. Filmation was producing: "Lassie's Rescue Rangers" and "Mission: Magic" for ABC and "My Favorite Martians" and "Everything's Archie" for CBS. That's two and a half hours of new animation per week - it was no wonder that Filmation sought such cost cutting measures as limited animation and stock animation to keep the work here in the United States. During that time, most other animation houses routinely shipped their work overseas as is the norm today. "The Magicks of Megas-Tu" was novelized by Alan Dean Foster in Star Trek Log Three published by Ballantine Books in January 1975. Also novelized in the book was "Mudd's Passion" and "Once Upon a Planet".